New legislation will transform the cannabis industry in California by allowing for widespread state-licensed temporary cannabis events, where adults can buy, sell, and consume cannabis. Currently, licensed cannabis events are restricted to the locations of county fairgrounds and district agricultural associations, which has limited the number and types of cannabis events. Once the new law takes effect on January 1, 2019, cannabis events can take place at any venue subject to local approval. California will soon be one of the few places in the world with licensed cannabis events at concert halls, event centers, and similar venues. We can anticipate a green renaissance of music, art, and food festivals featuring cannabis instead of alcohol. “Cannabis events support local economies and small businesses. Despite the fiscal and communal benefits such events bring to a city or local community, current law prohibits local governments from approving applications for cannabis sales at special events if they are held anywhere but on county fairgrounds,” explained Assemblymember Quirk. AB 2020 remedies this gap by allowing local governments to approve temporary cannabis event licenses at any venue they wish to permit. In some counties, the distance to get to the county fairground can be hundreds of miles away and take hours to get to. Several cities have expressed interest in approving temporary events but were frustrated by unnecessary hurdles in statute. “Cities Now Have Authority to Approve Temporary Cannabis Events,” Official Website of Assemblymember Quirk, September 26, 2018. “This division does not prohibit the issuance of a state temporary event license to a licensee authorizing onsite cannabis sales to, and consumption by, persons 21 years of age or older at a county fair or district agricultural association event, provided that the activities, at a minimum, comply with the requirements of paragraphs (1) to (3), inclusive, of subdivision (g), that all participants are licensed under this division, and that the activities are otherwise consistent with regulations promulgated and adopted by the bureau governing state temporary event licenses. These temporary event licenses shall only be issued in local jurisdictions that authorize such events. The term “this division” refers to Division 10 of the Business and Professions Code, pertaining to “Cannabis,” and the requirements of the three referenced paragraphs are that: (1) access to the area where cannabis consumption is allowed is restricted to persons 21 years of age and older; (2) cannabis consumption is not visible from any public place or non age-restricted area, and (3) sale or consumption of alcohol or tobacco is not allowed on the premises. Less than 48 hours before High Times SoCal Cannabis Cup kicked off April 20 at San Bernardino’s National Orange Show Events Center, news broke that city leaders refused to OK cannabis consumption and sales. The event still went on. And, despite organizers telling people they’d need to bring their own cannabis, many attendees said the festival operated much as it had in previous years. But given the last-minute controversy, hundreds of vendors pulled out and thousands of people didn’t show up. “Fate uncertain for Chalice cannabis festival after Victorville denies approval,” Orange County Register, June 14, 2018. Similarly, the Chalice festival scheduled for July 2018 was postponed (and the event organizer had to issue refunds) after the City of Victorville refused to grant local approval, claiming that the event conflicted with a city ordinance banning all cannabis sales. By contrast, The Emerald Cup submitted an application in June 2018 far in advance of its scheduled December 2018 event at the Sonoma County Fairgrounds, and obtained local approval from the City of Santa Rosa which was publicized in a new release in August. With the passage of Assembly Bill 2020, these difficulties will become antiquated. County fairgrounds and district agricultural associations will no longer have a monopoly on temporary cannabis events, and event organizers will flock to event-friendly local jurisdictions. Consequently, it is anticipated that hospitable cities and counties will begin to regulate cannabis events at the local level by means of cannabis event ordinances. Additionally, one should study the proposed permanent regulations, which contain several provisionsspecifically pertaining to temporary cannabis events, as well as the Initial Statement of Reasons(ISOR’s), which explain the rationales behind these specific provisions, and also keep an eye out for the final permanent regulations and the accompanying Final Statement of Reasons (FSOR’s) which will be issued later this year. Finally, one should review relevant local ordinances, guidelines, and protocols, if any, pertaining to cannabis events. Consultation with an experienced and knowledgeable professional is advised. To begin the process of obtaining a state license for a cannabis event, one first obtains a cannabis event organizer license from the Bureau of Cannabis Control. (The organizer can be a legal entity, such as a corporation.) Second, the organizer obtains written approval from a local jurisdiction authorizing onsite sales to, and consumption by, adults ages 21 and older at a specific cannabis event. Third, the organizer obtains a license for the temporary cannabis event (with a duration of no more than four days) from the Bureau of Cannabis Control. In other words, the Bureau of Cannabis Control anticipates that most event organizers will submit applications for multiple cannabis events each year, and wants to streamline the paperwork. An unanticipated consequence is that this process confers a potential advantage on applicants seeking local approval for cannabis events: having a Cannabis Event Organizer license issued by the State of California can extend significant credibility to an applicant appearing before local officials. Additionally, being a state-licensed event organizer can help persuade skeptical venue operators, booking agents, and event managers. The Bureau of Cannabis Control has published a one-page Cannabis Event Fact Sheet summarizing the process, as well as the rules and requirements for onsite sales and consumption, which can also be downloaded directly from the Bureau’s site here. An excerpt of the fact sheet is below. Once the licensed Cannabis Event Organizer obtains the Temporary Cannabis Event license from the Bureau of Cannabis Control, the real work begins. According to the proposed permanent regulations (which may not change much apart from deleting the location restriction) an event organizer has numerous responsibilities, including but not limited to: records retention so that records can be made available to the Bureau in hard copy or electronic form, whichever the Bureau requests; designation of primary contact person; cannabis waste management plan; security personnel licensed by the Bureau of Security and Investigative Services; having staff check all shipments of cannabis and non-cannabis goods intended for sale at the cannabis event for prohibited items, such as alcohol and tobacco; ensuring that cannabis goods sold onsite are transported by a licensed distributor or micro business in compliance with applicable laws and regulations; confirming that cannabis goods stored by a licensee at a temporary cannabis event are not left unattended; enforcing daily sales limits; restricting access to cannabis consumption areas to adults ages 21 and older; prohibiting consumption of alcohol and tobacco on the premises; ensuring that cannabis consumption is not visible from any public or non-age-restricted area; and many more. In other words, with great opportunity comes great responsibility. Cannabis event organizers are now free to choose any venue for which they can obtain local approval, but will be held responsible for ensuring compliance with all applicable laws, regulations, rules, and requirements. This is in sharp contrast to the unregulated bazaar-like atmosphere of previous “Proposition 215” events, a notable example of laissez faire capitalism in modern times. What about “Proposition 215” events? The Bureau of Cannabis Control has issued a notice regarding unlicensed cannabis events, insisting that lawful participation in cannabis events requires that the event be licensed by the Bureau, and warning licensees that participation in unlicensed events may give rise to disciplinary action. With regard to “Proposition 215” events, the Bureau takes the position that participation in unlicensed “Proposition 215″events may lead to civil penalties for unlicensed commercial activity. Apparently, the Bureau’s reading of the scope of the protections afforded to members of collectives and cooperatives by Health & Safety Code § 11362.775 is extremely narrow. 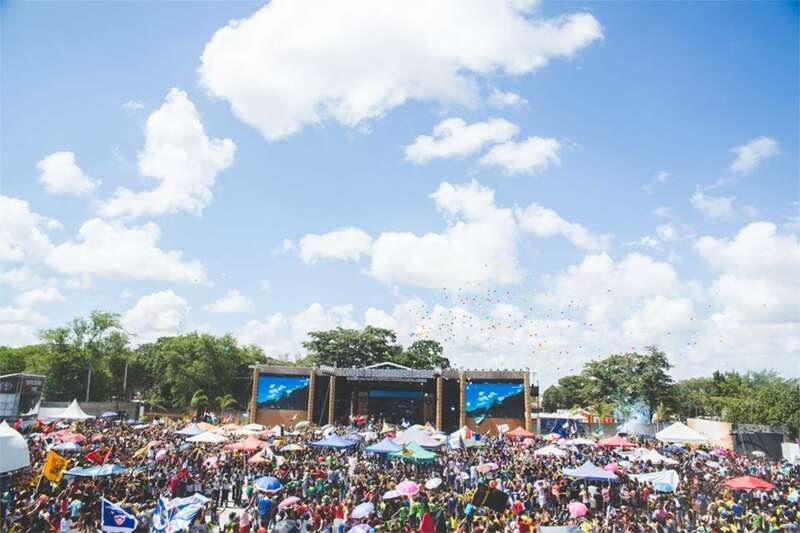 Given that the protections for collectives and cooperatives are scheduled to sunset on January 9, 2019, promoters of unlicensed events, or “seshs” will no longer be able to rely on the “collective and cooperative defense” as a justification. Notably, Assembly 2020 authorizes the Bureau of Cannabis Control (BCC) to require the event and all participants to cease operations without delay if in the opinion of the bureau or local law enforcement it is necessary to protect the immediate public health and safety. 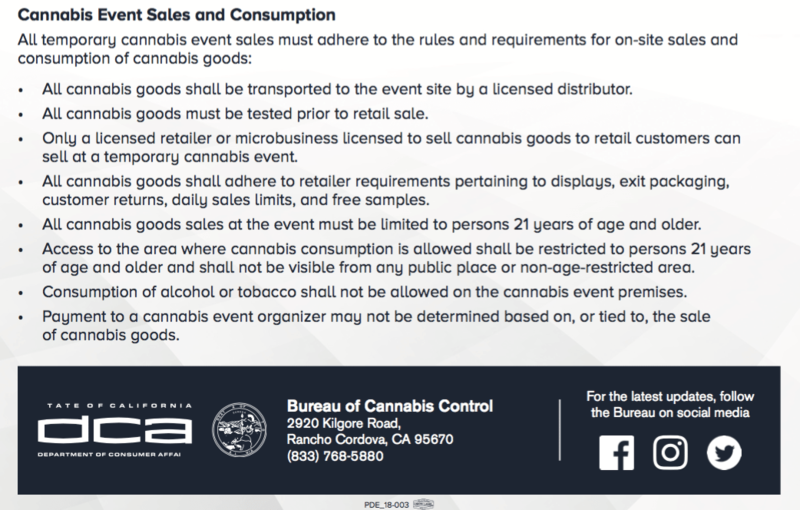 The BCC is also authorized to require the event organizer to immediately expel from the event any participant selling cannabis or cannabis products without a license from the BCC that authorizes the participant to sell cannabis or cannabis products; the BCC is authorized to require the event and all participants to cease operations immediately if the participant does not leave immediately. There is little recourse after a shut down order; an order by the BCC for the event to cease operations does not entitle the event organizer or any participant in the event to a hearing or an appeal of the decision. Once the new law takes effect on January 1, 2019, cannabis events will start to take place at many different venues, from hotels to restaurants to theaters to concert halls to spas to rustic barns to campgrounds. Expect a number of New Year’s cannabis events across the Golden State, and an increasing number of cannabis events as more entertainment industry professionals enter the cannabis event space. 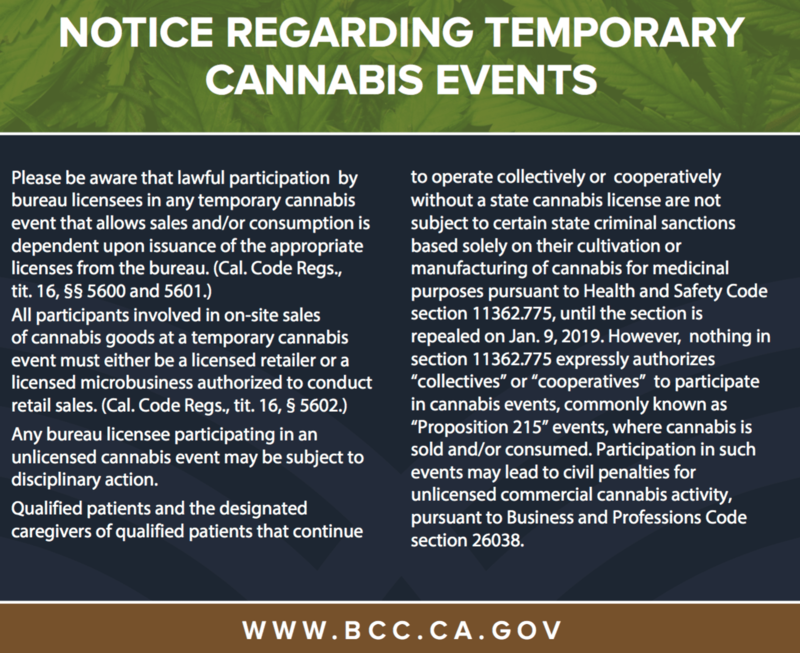 Currently, only licensed retailers (and microbusinesses authorized to conduct retail sales) may lawfully engage in onsite sales of cannabis goods at temporary cannabis events. Assembly Bill 2641, a companion bill to Assembly Bill 2020 which would have allowed licensed cultivators and manufacturers to obtain temporary cannabis retailer licenses for direct-to-consumer sales at cannabis events (up to four times per year), unfortunately was held in committee, and failed to make it through the Legislature this year. Hopefully, the 2019-2020 Legislative Session will promptly result in legislation which gives consumers direct access to cultivators and manufacturers at cannabis events. Since California is one of the few places in the world with licensed consumption of cannabis in a social setting, it will soon acquire a reputation as a global destination for cannabis events. Global cannabis culture is about to evolve. Assembly Bill 2020 portends a green renaissance of cannabis-friendly events featuring music, art, and food. We look forward to helping our clients navigate the legal complexities of this green renaissance. The above information is provided for informational purposes only. It is not intended as legal advice. Please contact the Law Offices of Omar Figueroa at (707) 829-0215 or [email protected] for legal advice and assistance with licensing and regulatory compliance pertaining to cannabis events.